In this Japanese name, the family name is Tōdō. Tōdō Takatora (藤堂 高虎, February 16, 1556 – November 9, 1630) was a Japanese daimyō from the Azuchi–Momoyama to Edo periods. He rose from relatively humble origins as an ashigaru (a foot soldier) to become a daimyō. During his lifetime he changed his feudal master seven times and worked for ten people, but in the end he rendered loyalty to Tokugawa Ieyasu, who became his last master. Statue of Tōdō Takatora at Imabari Castle. Tōdō Takatora was promoted rapidly under Hashiba Hidenaga, the younger brother of Toyotomi Hideyoshi, and he participated in the invasions of Korea as a commander of Toyotomi's fleet. His fiefdom at that time was Iyo-Uwajima. During the Edo period, the wealth of each fiefdom was measured as a volume of rice production in koku. Iyo-Uwajima was assessed at 70,000 koku. At the Battle of Sekigahara in 1600, although he was one of Toyotomi's main generals, he sided with Tokugawa Ieyasu. After the war he was given a larger fiefdom, Iyo-Imabari, assessed at 200,000 koku. Later in life he was made lord of Tsu (with landholdings in Iga and Ise), a domain of 320,000 koku. After the death of Akai Naomasa, some members of the Akai clan became retainers to the Tōdō house. Tōdō Takatora is also famous for excellence in castle design. 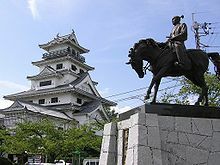 He is said to have been involved in building as many as twenty castles, including Edo Castle, Wakayama Castle, Uwajima Castle, Imabari Castle, Iga Ueno Castle and Sasayama Castle. Portrayed by Kim Myung-gon in the 2014 film The Admiral: Roaring Currents. A fictionalized version of Todo (renamed "Todo Tokotora") appears in the 2009 comic miniseries Yi Soon Shin: Warrior and Defender, where he is shown in a lover's relationship with fellow general Gurijima Michiyuki. Gurijima's death during the Battle of Hansando becomes Todo's primary motivation to eliminate Yi. Takatora is a playable character in the Samurai Warriors franchise debuting in Sengoku Musou Chronicle 2nd. In Samurai Warriors 4, he is portrayed as an Azai retainer and a close friend of Ōtani Yoshitsugu before joining the Toyotomi. ^ a b c "戦国 出世の方程式　～藤堂高虎 大坂夏の陣の大勝負～、日本放送協会 (The formula for promotion in the Sengoku ages, Todo Takatora's Challenge in the Osaka Castle Summer War, by NHK" (in Japanese). Retrieved 2007-03-27. ^ a b c "津市　文化課　藤堂高虎 (The city of Tsu official homepage)" (in Japanese). Archived from the original on 2006-10-06. Retrieved 2007-03-27. ^ "SamuraiWiki". Samurai Archives. Retrieved 2012-07-15. ^ "Exploring Japan's most fascinating samurai castles". CNN Travel. 2018-08-22. Retrieved 2019-03-25.